Your icebreaker, 50 Years of Victory, will take you to a part of the world more commonly associated with fairy tales and folklore—the North Pole. Crushing through multiyear pack ice, the journey can take as long as a week, which only helps heighten the level of excitement. Celebrate with champagne upon your arrival, and if conditions permit, soar above the Earth on an optional hot air balloon ride. Your adventure begins with a one-night stay in Helsinki, Finland’s capital. 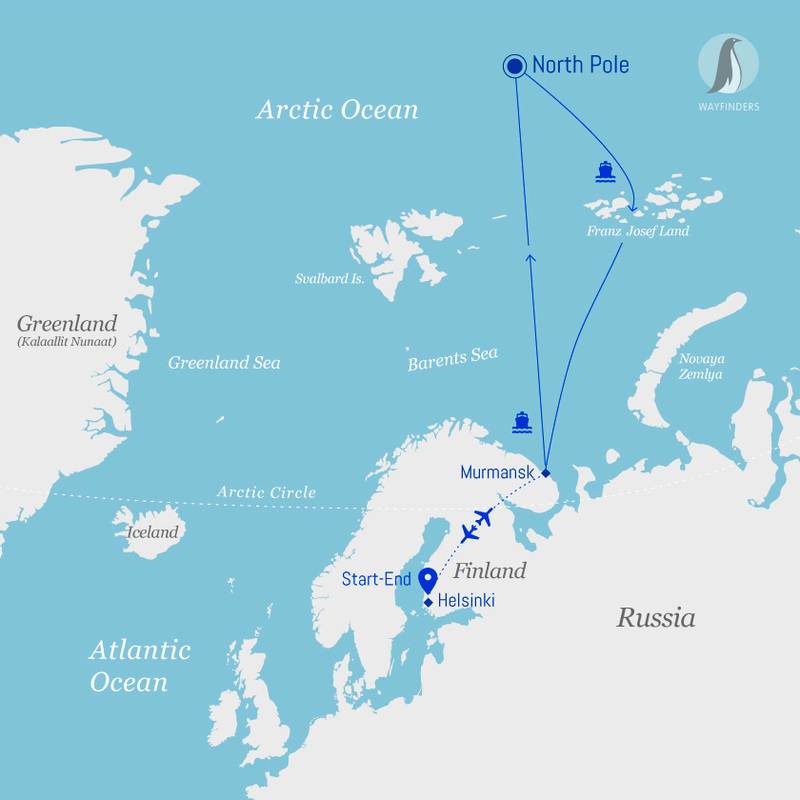 From Helsinki, you’ll join your fellow passengers on the charter flight to Murmansk, Russia, where you’ll embark on your voyage to the North Pole and get acquainted with 50 Years of Victory, the world’s largest and most powerful icebreaker. Being on board Victory and feeling the icebreaker as it crushes through the arctic pack ice is an experience you’ll never forget. Just as memorable is boarding the ship’s helicopter for a thrilling aerial view over the ship and the expansive Arctic Ocean. The anticipation reaches a climax as you arrive at the North Pole! Many travelers find themselves overcome with emotion, while others are in a festive and celebratory mood. Take photos, call your family, wave a flag—just be sure you enjoy your moment at the top! Later, everyone will celebrate with a champagne toast and a barbecue on the ice. If the opportunity allows, you have the option of taking a polar plunge into the icy waters around the North Pole. We’ll also attempt to launch passengers high above the Pole in our hot air balloon to commemorate this great moment (this is highly weather dependent). On our return voyage, you can sit back and relax. As you head farther south, you may get lucky and spot polar bears hunting for seals. This group of 191 islands forms the most northerly archipelago in Eurasia and lies entirely within the Arctic Circle. Here, you’ll explore Cape Flora and discover historic remains from three ill-fated arctic expeditions. When conditions permit, we’ll launch the Zodiacs and cruise beneath towering cliffs to explore remote seabird colonies. The 50 Years of Victory helicopter will provide aerial sightseeing, and our Zodiacs will transfer you to seldom-visited landing sites. Enjoy your time on deck or reminisce with your shipmates and new friends as you cross the Arctic Ocean back to Murmansk. Expedition staff will be on hand to answer any remaining questions and point out wildlife during the return journey. Returning to Russia’s most northerly city, it will be time to bid farewell to 50 Years of Victory. You’ll be transferred to the airport for your charter flight to Helsinki, Finland, to enjoy one final night with your newfound friends. 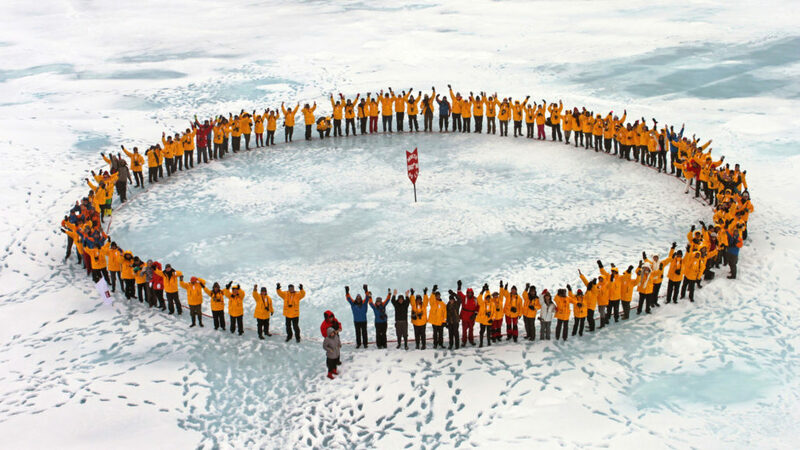 After breakfast, your official Quark Expeditions® journey comes to an end. We do encourage you to spend time exploring Helsinki, Tallinn (the capital of Estonia) and Saint Petersburg. Mandatory transfer package available for $1,895. Nonalcoholic drinks, beer and wine are included on board during lunch and dinner. All other bar beverages are available at an additional cost. Russian visas are required for tourists from most countries. This voyage requires double-entry Russian visas. See your country’s Russian consulate or embassy for details.